Our first product, the Spikerbox, uses invertebrates to help you learn about how the cells in the brain work to communicate. We also have an Muscle SpikerBox that you can use to record electrical activity produced by cells in human muscles. If the science behind these products appeals to you, you should also check out the Completo, which is a full tabletop, portable electrophysiology rig. All of our products are accompanied with Lesson Plans and Experiments to make learning (and teaching) neuroscience a breeze. We have a number of other popular products for use in both the classroom and in any lab performing science, including: the RoboRoach, that can give you insight into neurostimulation, a Micromanipulator that can help you position your electrodes precisely, and a RoachScope that allows you to turn your mobile phone into a microscope. 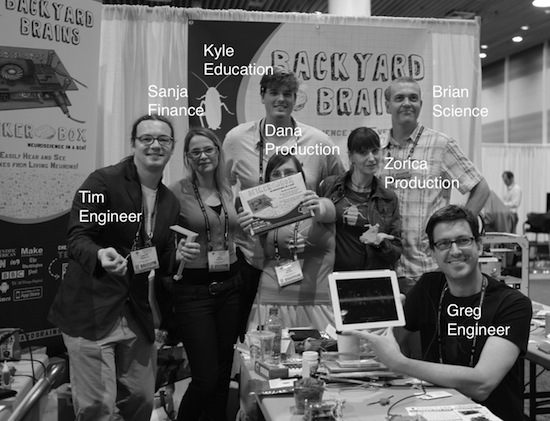 Above: Backyard Brains at its fourth SfN Booth! (October 2015). Katie Wiykovics, Computer Scientist. Works on team: Production, Wrangles Cockroaches. John "Tinker" Nagle. Turner of wrenches, maker of motorcycle parts. john@backyardbrains.com Working on team: Production. Zachary Reining. zach@backyardbrains.comWorking on team: Engineering. Will Wharton. Poet. will@backyardbrains.com Working on teams: Sales, Biz-Dev, and Education. Stanislav Mircic. Computer scientist. stanislav@backyardbrains.com Working on team: Software, Firmware, Hardware. Caitlin Clayton, Production Staff, RollerDerby Master. Working on teams: Inventory and Production. Greases the skids so gear flies out the door quickly. Cristina Mezuk, Artist. cristina@backyardbrains.com Working on team: Jealous Illustration. Brian Tracy, Ph.D., Professor. brian@backyardbrains.com Working on teams: Education, Engineering. Advising us on our new human muscle experiments and hardware. Charlie Taylor, Ph.D., Neuroscientist. charlie@backyardbrains.com Working on teams: Education, Science. Florencia Edwards, Writer, Literatura de Latinomerica Maestra. flo@backyardbrains.com Helping us with grants and day to day biz. Pablo Guerra, Circuit Bender, Actor. The BYB official model, appears in most of our human interface videos. Italo Ahumada Morasky, Comic Book Artist, Sculptor. Illustrates experiments we develop in Chile. Roberto Herrera Pellizzari, Designer, Builder of Bicycles. Designed new microscopes and interfaces for all the world. Nick Ristow. Engineer and RC Pilot. Worked on team: Engineering. Ivan "Vanya" Procopovich. Traceur, Artist. Worked on production and drew a lot of our artwork. Gabriela Perez Itura, Media Artist. Worked on team: Production, Education. Daniel Silva, Biochemist, Linguist. Worked on team: Education. Bill Reith, Engineer, Maker. 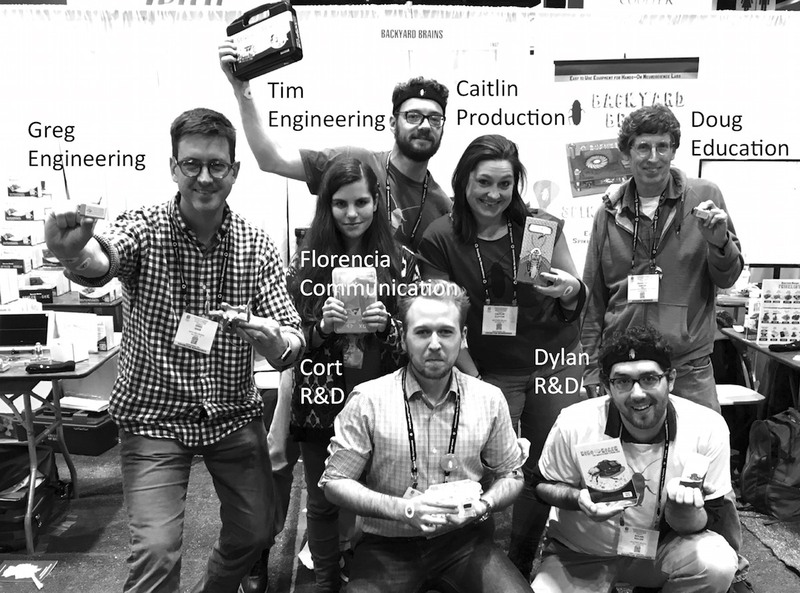 Worked on team: Product Engineering. Dana Nelson, Education Hacker. Worked on team: Production. Alex Hatch, Designer. Worked on team: Prototyping, Product Design. Kyle Shannon, Recent UCSD neuroscience graduate. Worked on teams: Cognitive Science, Education, Sales, Marketing. Josh Williams. Operations manager of Digital Ops and AHA. Education leader for Bright Futures. Worked on team: Production. Brian Martin. MSU spartan and microscope expert. Worked on team: Production. We try to keep track of how many people have heard what neurons sound like for the first time with our SpikerBoxes. To date (Tue, Apr-23-2019) at least 45,727 now know what their brains sound like.